Well-written, well-played and ultimately, well, annoying, Adam Bock’s A Life has gotten great reviews from almost everyone. We are the dessenting few. There is a banality in our daily lives that we want to hide behind long narratives of what we’ve done, and how we feel. We desperately want the ordinary to be extraordinary. In A Life, Adam Bock’s new play at Playwrights Horizons through November 27th, the characters find it hard to connect. Nate (David Hyde Pierce) delivers a long and (at least in my lights) tedious monologue, centering on relationships and the astrological that charts them. It’s a tribute to his talent and timing that he can hold our attention for as long as he does. Nate’s soliloquy and then when his sister Lori (Lynne McCullough) thanks us all for coming. It is an irony that she is grateful that Nate had so many friends in his life, since the theme in A Life seems to be his isolation. Of all the friends Nate narrates about, we meet only one in A Life. Nate shares a coffee and man-gazing with his best friend is Curtis (Brad Heberlee) at a shop near his apartment. Laura Jellinek’s active set pivots from one scene to another with deliberate drama. Anne Kaufman’s direction cannot keep the pace on this slow moving 85-minutes fast enough to keep the drama from sagging under its own weight. To learn more about A Life, and for tickets, please visit the PH website. Eugene O’Neill (“The Iceman Cometh,” “Long Day’s Journey into Night,” “Mourning Becomes Electra” etc. )is not known for inspiring chuckles but the New York Neo-Futurists (Neos) know how to get guffaws out of tough material. In fact, you might think of “The Complete & Condensed Stage Directions of Eugene O’Neill Volume One: Early Plays/Lost Plays,” at The Kraine Theatre through extended to October 1st, 8th as the actor’s revenge on a playwright loath to allow anyone to mess with his vision. It is said that O’Neill would have preferred to have his plays just read, not acted, and his elaborate stage directions suggest an obsessive desire to micro-manage all aspects in the performance of his work. a narrator, Jacquelyn Landgraf (also not pictured), are inventive and lively. 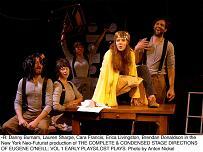 “The Complete & Condensed Stage Directions of Eugene O’Neill Volume One: Early Plays/Lost Plays,” adapted and directed by Christopher Loar, compiled from seven early O’Neill works, features narrated stage directions which lead the ensemble to scramble, reassemble props, strike poses, fall onto seats, and make their exits. The cast entertain by making nuanced adjustments to capture expressions, gestures, even sighs. “The Complete & Condensed Stage Directions of Eugene O’Neill Volume One: Early Plays/Lost Plays” is exhilirating and giddy. “Cirque De Legume,” at 59E59 Theaters, as part of the citywide 1st Irish Festival, through October 2nd, hail from London by way of Paris’ respected “clown school”–Ecole Jacques Lecoq. Jaime Carswell and Nancy Trotter Landry enter to rollicking big tent music and great fanfare. After their big entrance, they seem ill-at-ease, and the rest of the performance is dedicated to challenging the audience. “How about that?” is their refrain after every trick. “Cirque De Legume” ise delicious slight-of-hand, and acrobatics in their successful effort to please the crowd. They add a sports metaphor to their routine when she spells out C-I-R-Q-U-E… and they bump chests. Training a barking lettuce named “Dusty” to jump for a carrot is just the opening number in this manic and charming show.